OER15 – Better late than never! It’s rather late in the day to be posting an OER15 blog post, but better late than never hopefully! :} As ever it was a hugely enjoyable and inspiring conference, and as is often the case, Marieke Guy of Open Knowledge beat me to it and wrote a great summary of the conference in her blog post OER15: Window Boxes, Battles and Bandwagons. I’m not going to try and duplicate Marieke’s fab write up but I do want to pick out a few of the highlights of the conference. The keynotes were excellent as always. Cable Green was in typically unequivocal form in his opening talk Taking OER Mainstream. He reminded us that in order to be considered as OER, content must be free and you must have legal rights to reuse, revise, remix, redistribute and retain it. And lest there be any ambiguity around Creative Commons licences, Cable stated that resources licensed with the No Derivatives clause are not OER. And he called Udacity out for openwasing with their Open Education Alliance, which despite the name, does not appear to be open in any sense of the word. I was delighted to be able to join a panel session with Cable immediately after his keynote alongside fellow Open Policy Network colleagues Nicole Allen of SPARC and Alek Tarkowski of Centrum Cyfrowe Poland, discussing open education and the broader policy environment. Picking up on the themes he’d introduced in his keynote, Cable highlighted the importance of providing support to move from policy to implementation, Alek highlighted the work of the Polish open e-textbooks program and Nicole discussed what we can learn from the success of Open Access advocacy. I particularly liked Nicole’s point that while policy plays an important role in promoting open education, it is not hugely effective in engaging students in OER; the involvement of the library can be much more important here. I presented a short case study on crowdsourcing policy from the ground up, based on our experiences of developing the Scottish Open Education Declaration. While this can be a good way to engage communities in policy development; acting on policies that are not supported by funding is challenging and pushing community policy up to government level can be difficult. However I was inspired by Alek’s comment that in Poland, they had been working on open education policy for many years before the government sat up and took notice, but when they finally did, all the groundwork had already been laid. The immensely talented Kevin Mears drew this clever sketch note of our session, but I should clarify that I didn’t quite say “the time for declarations has passed”. That was a direct quote from Cable’s keynote and he was actually suggesting that we now need to move beyond declarations of intent to active implementation. This is something I absolutely agree with, declarations are a useful tool to help raise awareness of the value of open education but they are simply one step along the way and ultimately the role of policy has to be to inform and transform practice. In terms of the Scottish Open Education Declaration, there would be huge value in evidencing the points of the declaration with examples of practice from across the sector, and judging by the number of colleagues who presented from Scottish institutions, there is certainly plenty of practice to choose from. I’m hoping to (eventually!) blog an overview of Scottish colleagues’ contribution to the conference over at Open Scotland, along with my slides from, Common Ground, a short paper I presented on open education initiatives across all sectors of Scottish education. This was the first time I’d heard Brian Lamb talk and he was every bit as engaging and thought provoking as you might expect. Brian suggested that when it comes to embracing the open web scalability, sustainability and institutional wide impact are still an issue. One solution to this problem is that we need to build “training wheels for the open web” to help colleagues who struggle. Two initiatives that do just that are Domain of One’s Own, which provides web space to encourage colleagues at University Mary Washington to explore the creation and development of their own digital identities, and the fabulously named SPLOT! which aims to make it easy to post activity to the open web without creating accounts, or providing personal information. One important point I learned from Brian’s presentation is that all cool developments happen over drinks :) Oh and he also highlighted the excellent development work of Pat Lockley which gets him extra points in my book. The theme of this years conference was Mainstreaming Open Education, and while I think we all agree that we do want to see open education as an integral component of mainstream education I confess to being slightly uneasy that we run the risk of neglecting the experience of many colleagues for whom open education practice is increasingly being pushed to the margins as a result of budget cuts, redundancy, the casualisation of teaching contracts and the continued erosion of terms and conditions. Josie Fraser touched on these themes in her brilliant keynote about Leicester City Council‘s policy to give permission to school staff to openly licence the educational resources created in the course of their work. Josie acknowledged that the mainstream can be a very normative and exclusionary place, synonymous with privilege, and tokenising rather than embracing however it can also recognise diversity and value difference. Digital literacy is key to engaging people so they can critically challenge their online environments. What really inspires me about Josie’s work with Leicester City Council, it that it provides an excellent example of how open education policy really can support transformative practice. If you haven’t already listened to Josie’s keynote, I can highly recommend it. It’s worth an hour of anyone’s time. Unless you’re a dolphin lover. At the end of each OER conference it’s traditional for the organisers to pass the baton to the new co-chairs and this year I’m delighted to say that the baton passed to Melissa Highton and I. We’re honoured to announce that, for the first time ever, OER16 will take place in Scotland at the University of Edinburgh in April 2016 so watch this space! Earlier this month I went along to the second Opening Educational Practices in Scotland Forum where I’d been invited to present an update on the Scottish Open Education Declaration. The event began with an update from the OEPS Project team outlining their progress in supporting a network of open education practitioners, developing a Scottish open education hub, collating case studies and supporting the development of new content and practice. There was considerable discussion as to the role of the hub, which has been revised following discussions at the first OEPS forum. Although the hub will facilitate aggregated OER search, it will focus more on being a community hub for open education practice. For a comprehensive update on OEPS progress, the project recently published their first report here: First OEPS Project Report. Undoubtedly the highlight of the morning, was Laura Czerniewicz remote presentation from Cape Town on international perspectives on opening educational practices. Laura spoke about how openness and the internet have reconfigured the post traditional education landscape and presented a series of case studies from South Africa. Laura went on to suggest that open education exists in an extremely contested and complex environment. In Africa there has been some scepticism about open education as it is seen as an extension of the commodification of knowledge, however Africa has a strong narrative culture of sharing which can be harnessed to encourage the sharing of open education resources and practice (Jane-Frances Agabu, National Open University of Nigeria). One of the most interesting and challenging points Laura raised in her presentation centred on the legitimacy of piracy as a means of sharing educational content in the face of rising text books costs. This is certainly a point I would agree with. In order to make an impact, policy ideally needs to be backed up by adequate resources and funding, however this also begs the question of how to support unfunded policies that emerge from the community such as the Scottish Open Education Declaration. 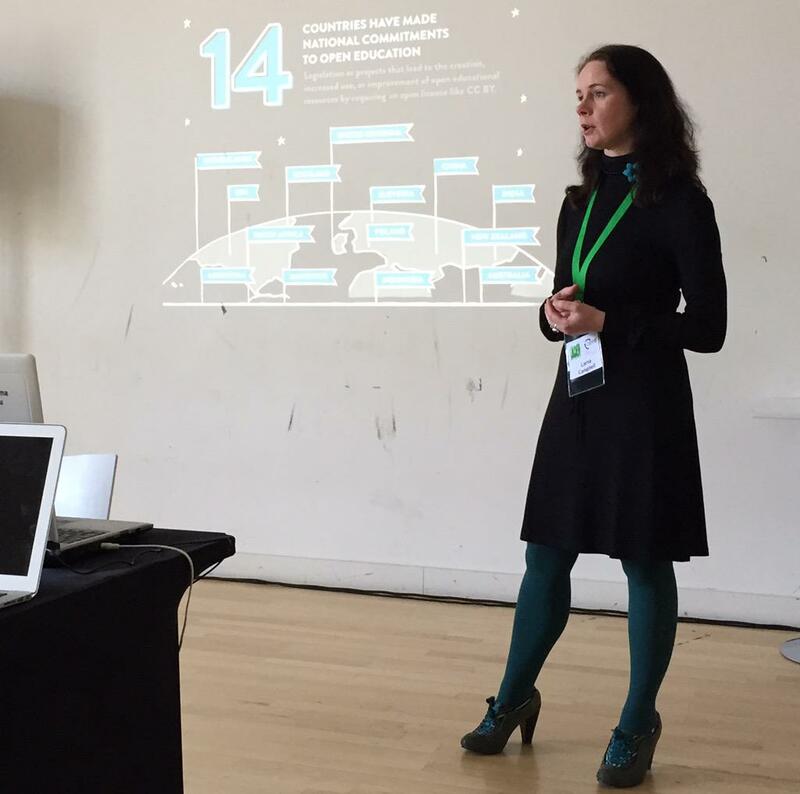 In the afternoon I presented two workshops on future directions for the Scottish Open Education Declaration. The second draft of the Declaration was published by Open Scotland in December 2014, after receiving a small amount of very welcome funding from the OEPS Project. Shortly afterwards, the ALT Scotland SIG forwarded the declaration to Angela Constance, the new Cabinet Secretary for Education and Lifelong Learning. Although Open Scotland has not been in a position to actively promote and disseminate the declaration recently, primarily due to lack of funding, it was evident from participants at the workshops that there still seems to be real appetite across all sectors of Scottish education to continue taking the Declaration forward. Several participants said that they had found the declaration useful for raising awareness of open education within their own institution and for triggering discussions about open education at policy level. The Scottish Funding Council also appear to see some merit in the Declaration and during discussions with workshop participants and members of both Open Scotland and the OEPS Project, we were able to identify several steps to take the Declaration forward. While the Declaration may have some value as an aspirational statement of intent, clearly it will carry considerably more weight if each point can be evidenced by examples of existing practice in Scotland and further afield. Examples of existing practice could be crowd sourced and collected via the Declaration Comment Press site and collated from evidence gathered by the OEPS Project. In order to highlight the value of both open education and the Declaration at government level it would be useful to be able to provide evidence of positive impact. Assessing the impact of open education initiatives is always difficult as quantitative measures have a tendency to miss the bigger picture and, arguably, the ethos of open education. Gathering qualitative user stories and case studies is likely to be a more useful way to provide evidence of the impact of the Declaration. The case studies being collated by the OEPS Project will hopefully be of particular value here, but continued efforts should be made to gather user stories from across the sector. When the first version of the Declaration was drafted in early 2014, we made a conscious effort to ensure that it tied in with Scottish Government policies and strategic objectives. Clearly the policy landscape has changed over the last twelve months and it would be useful to revisit the Declaration to ensure that it supports current policy particularly with regard of formal and informal learning, social inclusion and widening access. A number of bodies and agencies have been identified that could potentially provide valuable support for the Declaration, one of which is Universities Scotland. Although an encouraging number of university colleagues have already made valuable contributions to the declaration, it would be beneficial to engage senior managers to ensure that open education is supported at policy level across the higher education sector. It is important that the Declaration represents all sectors of Scottish education; therefore it is critical that we find routes to engage not just higher education but also schools, colleges and the third sector. We would welcome suggestions from colleagues as to how to raise awareness of the Declaration and encourage engagement with open education across all sectors of Scottish education. Clearing the post-Christmas mail backlog is always a bit of a chore, but it was well worth it to find two emails from the OER15 committee saying the papers I submitted have been accepted for this year’s conference, which is taking place in Cardiff in April. I’ve had a paper at all but one of the OER conferences since they kicked off in 2010, though I believe John Robertson was on presenting duties first time round. OER is one of my favourite conferences and it’s been great to see it going from strength to strength, particularly when many predicted its demise after the UKOER programme came to an end in 2012. On Monday I gave a presentation on Open Scotland and the Scottish Open Education Declaration at a Scottish Higher Education Developers event hosted by the inestimable Jisc RSC Scotland. Vicki Dale was kind enough to tweet my presentation and Sheila MacNeill drew one of her fabulous visual notes, so I’ve collated them into a little Storify here and embedded the presentation below. This rather crowded map of open education in Scotland is the product of a brief ten minute brainstorm I took part in at the launch of the Open University’s Opening Education Practices in Scotland (OEPS) project in Edinburgh last week. My scribbles may not be very legible, and the geography is questionable, but even if you can’t read the text, this map does give a good impression of the sheer breadth of open education practice already taking place across all sectors of Scottish education. And it also gives a good impression of the significant task facing the OEPS project if they are to effectively engage with existing open education initiatives in Scotland. This is a point that Sheila MacNeill and Joe Wilson have already raised in two thoughtful blog posts (Stuck in the middle with…open and #Oepsforum14 #Openscot Reflections.) Though supportive of the project and enthusiastic about its potential, both Sheila and Joe have raised valid questions about how OEPS plans to support existing open practice in Scotland, and how it will construct a distinctly Scottish narrative of open education. I’m delighted to have been invited to Berlin later this week to give a talk at OERde14 – The Future of Free Educational Materials. I’ll be talking about a range of contrasting initiatives that have aimed to promote open education policy and practice in Scotland, England and Wales over the last five years, including the UKOER Programme, Open Scotland, OER Wales, the Welsh Open Education Declaration of Intent, the Scottish Open Education Declaration and the Opening Educational Practice in Scotland project. I’ll also be reflecting on the different approaches taken by these initiatives and asking what Germany can learn from the experiences of open education practitioners in the UK. What, if any, is the value of open education policy? Do institutions need open education policies? 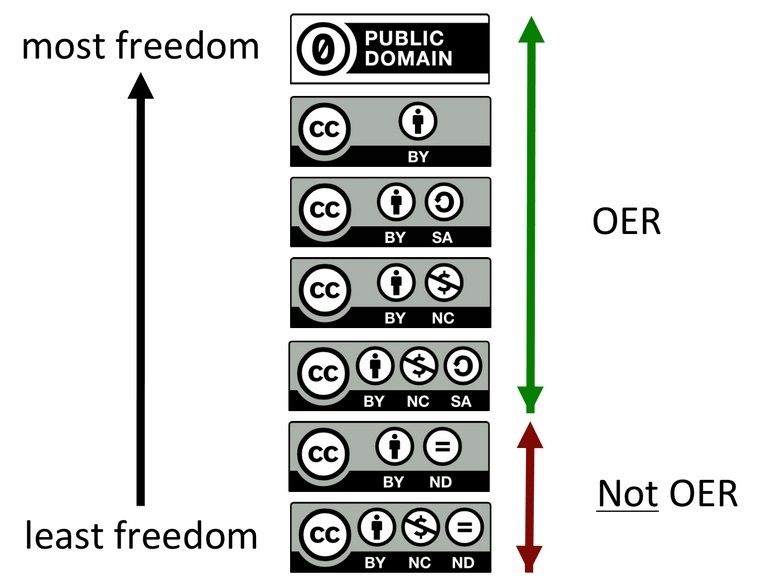 Should government agencies play a role in the development of open education policy? Are there conflicts between commercial interests and market forces, and open education policy and practice? How can open education initiatives be nurtured and sustained? And what do we mean by “open education” anyway?! Last week the ALT Scotland Special Interest Group hosted the second Open Scotland event, Open Education, Open Scotland at the Informatics Forum at the University of Edinburgh. This free and open event was attended by sixty colleagues, and speakers represented every sector of Scottish education including schools, further education, higher education and government. Earlier this week I was invited to present about Open Scotland at the CILIP Scotland Conference in Dundee. This is the first time I’ve attended the CILIPS conference and it was a really lively and engaging event with over 300 participants and an inspiring keynote on “Challenges, Choices and Opportunities” from Martyn Evans, Chief Executive of the Carnegie Trust. My Open Scotland presentations seemed to be well received and I was very encouraged to have a couple of questions about the potential role of public libraries in opening access to educational resources, particularly for the school sector. When we held the first Open Scotland Summit in Edinburgh in 2013 it occurred to me that the education sector potentially has much to learn from the public library sector in terms of open practice. Open Education: From Open Practice to Open Policy by Lorna M.Campell and Li Yuan. 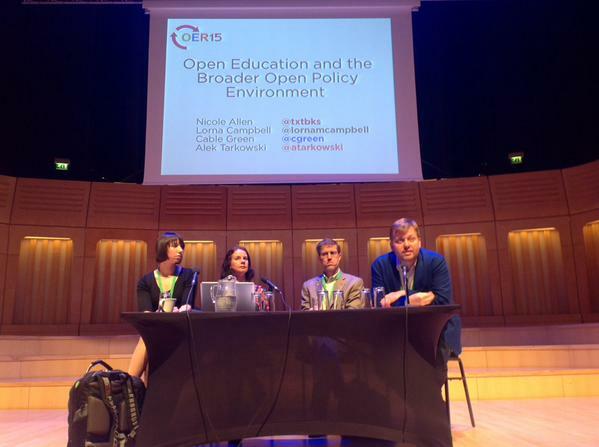 Open Education: From Open Practice to Open Policy is very much a natural progression from open education parallels we’ve run at previous Cetis Conferences. The first open education session we ran at the Cetis Conference was the UK OER Scoping Session way back in 2008 and since then we’ve progressed through the OER Technical Roundtable, Building Collections of OERs, to Open Practice and OER Sustainability, so it seemed natural that this year’s session should focus on moving from open practice to open policy.